Loose tuning gears won't hold pitch adequately. We all know that, and if musician claims that the instrument won't hold pitch, I'll look to make sure all the gears are mounted firmly. Mostly, I'm talking about the tuner that is "microscopically loose," one that is still in the same position but doesn't provide really rigid mounting for the end of the string. Or, one where the upper bushing is not firmly mounted in the peghead. Many years ago I was speaking to Bill Collings about guitar setup and he told me that a loosely mounted tuner could cause a dulling of the tone of that string. He said it was a specific part of the design of his guitars to make sure that all the tuners fit as tightly as possible in their countersunk holes, and that they were mounted firmly to avoid loss of the strings' vibrating energy. I listened to him about this because, hey, his guitars are some of the brightest on the planet. I said that sounded plausible, but that I had never experienced an instrument with a tonal difficulty as a result of a loose gear. You can guess the rest of this story. It was only a short time later I used this piece of information to diagnose a guitar with a severely damped string caused by a loose tuner. 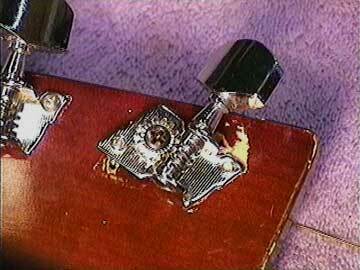 Thankfully, loose tuners are easy to fix. You just tighten 'em up. 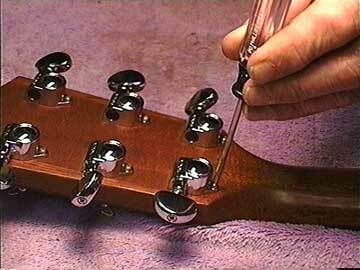 In fact I always try to check the tightness of the tuner mounting nuts from the front of the peghead every time I restring a customer's guitar. It's an easy precaution. If the little mounting screws are loose or stripped out, they're easy to fix, also.